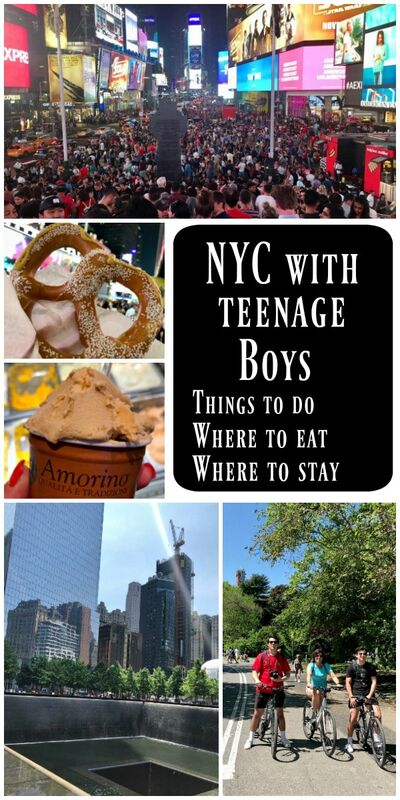 If you’re planning a trip to New York City and you happen to have teenage boys in tow, I’m sharing about Things to Do in New York City with Teenage Boys. 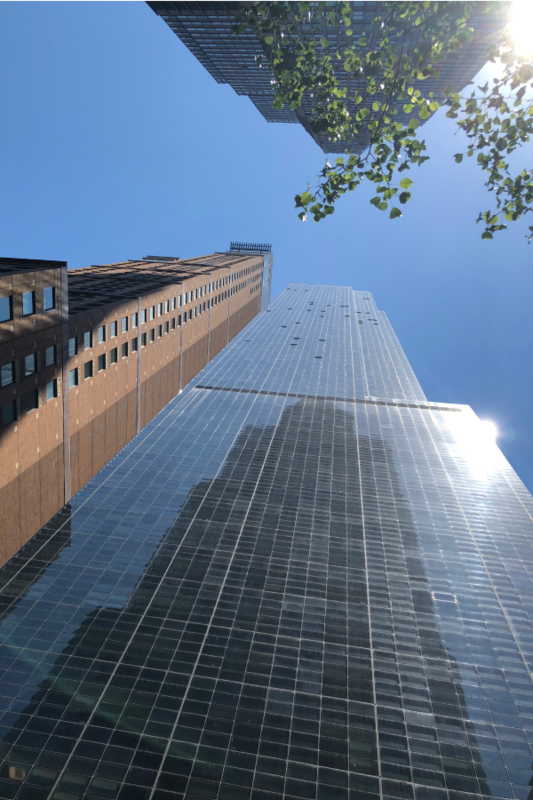 I’m also sharing about the best places to stay in New York City when you have teenagers with you and the best places to eat in New York City with teenage boys too. Read on! 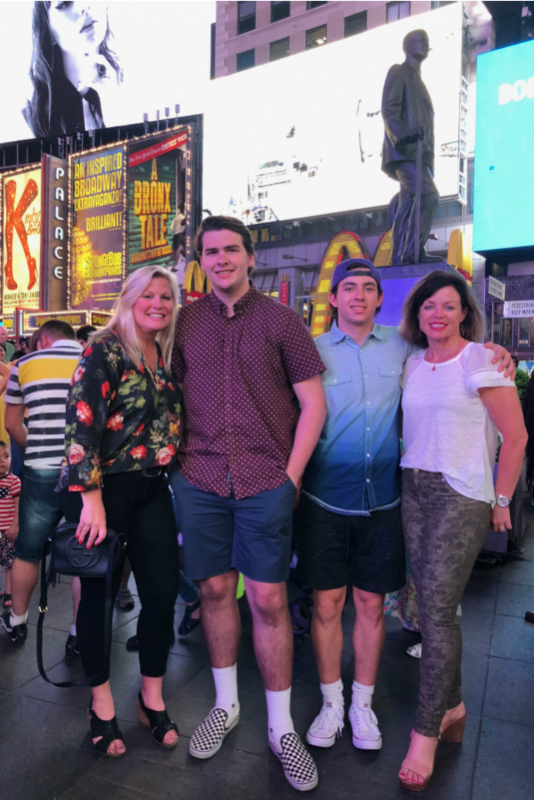 My friend Mary Jo and I planned a trip to New York City with teenage boys (our sons!). They had just finished their Junior year in high school, and we thought it would be a good time to get some quality time in with them before they head off to college next year. I’ve been to NYC many times. It’s cold in the winter, and it’s beautiful in the spring. New York City can be pretty hot and humid in the summer. We were there the week of Memorial Day, and it was already major ice cream weather. I’ll give you a recommendation for a couple of hotels that I’ve stayed in that I thought were in pretty good locations and decent prices. 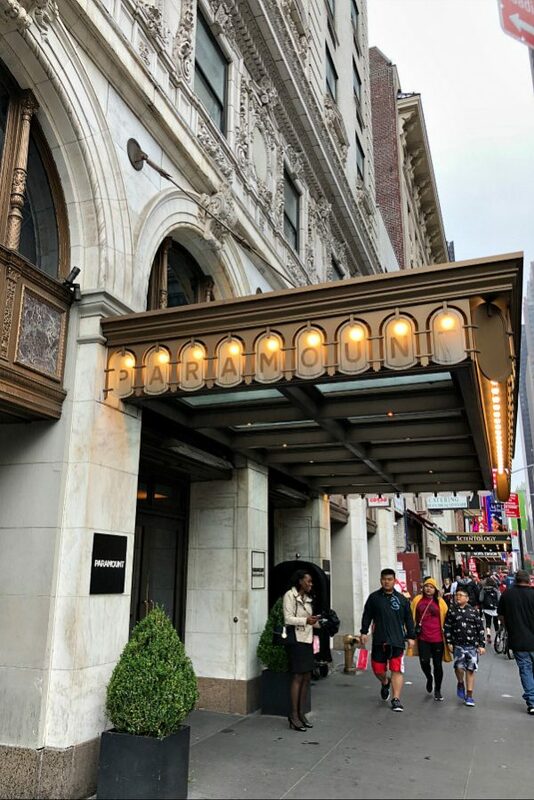 This time, we stayed at the Paramount Hotel (near the center of Times Square, but like a block away from all of the hustle and bustle). This is the third time I’ve stayed at this hotel. It’s in a great location. The prices are always reasonable. The rooms and bathrooms are small, so I wouldn’t stay in a room with more than two people. We loved that there was a Pret a Manger on the corner near the hotel for coffee and breakfast sandwiches every morning. This summer the restaurant and bar are being remodeled at Paramount, so that wasn’t convenient when the Moms were needing a glass of wine! Once they’re finished remodeling, all will be good again. I’ve also stayed at The Tuscany Hotel near Grand Central Station. Also a great location, and the rooms and bathrooms in that hotel are HUGE- which is not so common for NYC. I love the breakfast they offer at this hotel every morning, and they open up their bar for drinks in the evenings too. Here’s a post I wrote about staying at the Tuscany Hotel. Here are my travel mates. Brooks (RecipeBoy) is on the left. This might surprise some of you who have been following my blog for the last 7 years because my little boy has grown into a 17-year old, 6’4″ man! My friend Mary Jo and her son Michael joined us on this trip. 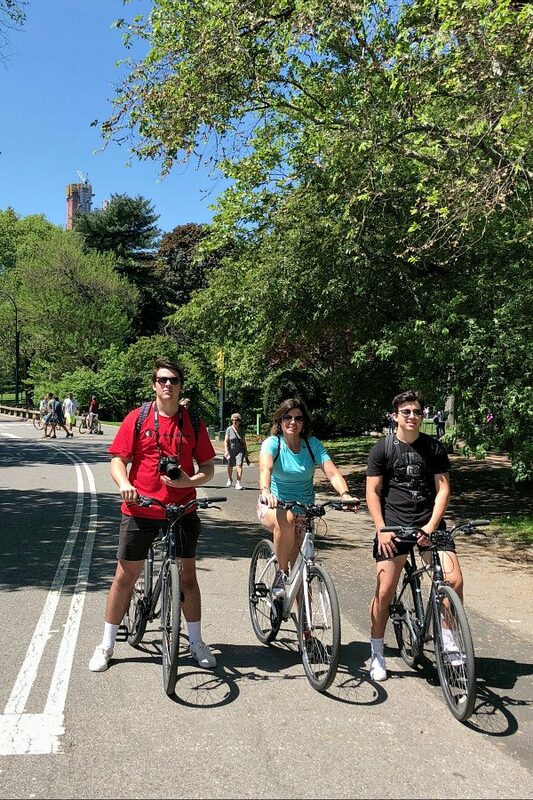 One of our favorite activities on this NYC trip was to rent bikes and ride the loop around Central Park. We got a 2-hour bike rental, which was just perfect for us. You will want to get a longer time period if you plan to stop in several places around the park. It’s a beautiful ride. There are some ups and downs in the park but nothing major. 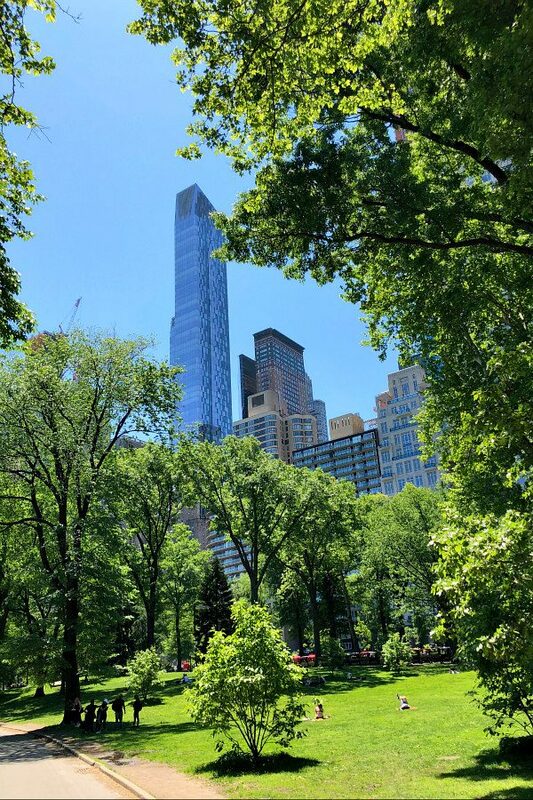 Budget tip for renting bikes near Central Park: Although more convenient, you’ll spend more money if you rent the bikes at the entrance to Central Park. We looked for the guys who held the “deal” signs near Central Park and were able to take their coupon and walk a couple of blocks away to a bike rental place (I don’t remember what it was called, but you can just look for guys holding signs near the park!) I secured our two bikes (no helmets or locks) for two hours, and the price was less than $10 total. Bargain! 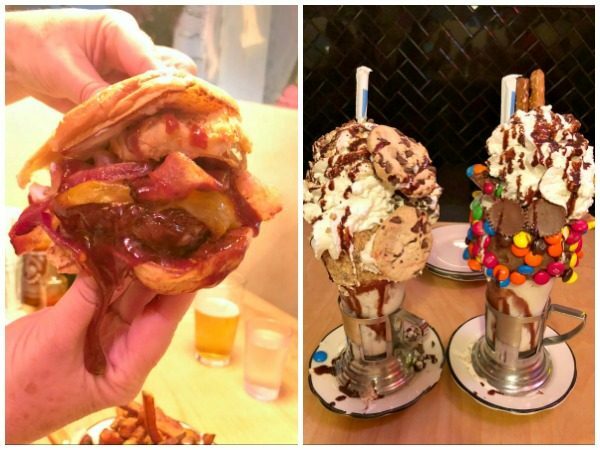 Black Tap Craft Burgers & Burger (locations in SoHo and Midtown) is a must-go kind of place to take teenage boys to get burgers and shakes. They truly have the most amazing burgers (all kinds) and some out-of-control milkshakes to choose from too. Yes, those are some pretty crazy milkshakes you see there on the right. And if the parents have been walking around NYC on a very hot day, a cold beer at Black Tap doesn’t taste too shabby either. Brooks and Michael were slightly resistant to agreeing to go to a Broadway show. We promised them that we wouldn’t steer them wrong. 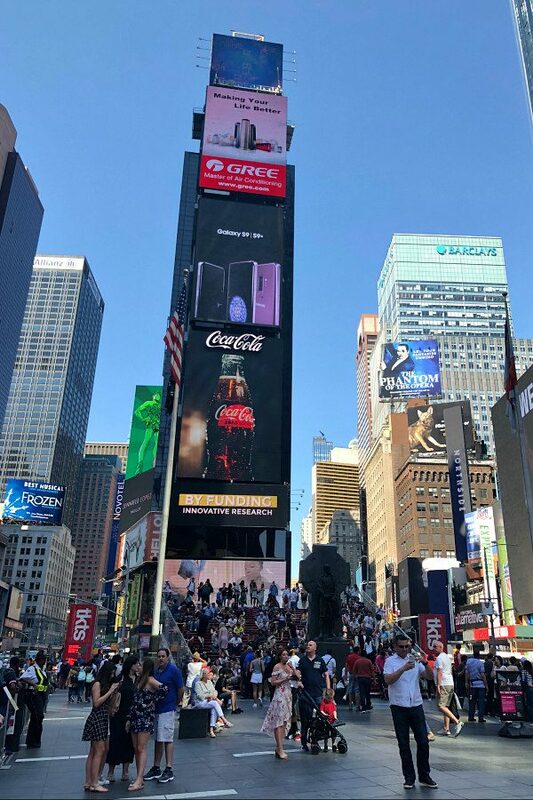 Tip: if you go the the TKTS booth in Times Square at 2:30pm (they open at 3), you can wait in line (it’s shaded in the afternoon because the sun goes behind the tall buildings) to get discounted tickets. The list of available shows for that day is displayed, and you can choose from those. The best part is that they have many staff members who are circulating while you’re in line. You can ask those staff members about the shows, and they will help you decide what show you might like best. After much discussion with those folks, we decided on A Bronx Tale to see with our boys. It was a good choice, and they enjoyed it a lot! Other suggestions for us were Rock of Ages (it wasn’t playing the night we were going, but I think teenage boys would love that one), Jersey Boys (I agree, good one) and School of Rock (most definitely). These are the shows that aligned with our boys’ personalities most, but obviously you have to consider what would be best for your own kids. My son Brooks was born in 2001. I was nursing him and watching the Today show the morning of that tragic day of 9/11/01. 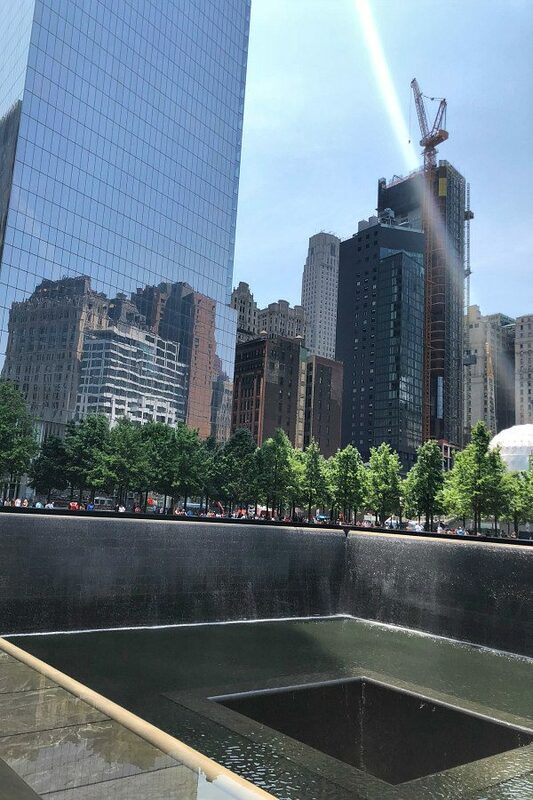 The boys have learned about that day in their US History classes, and we felt it was important to take them to the 9/11 Memorial and Museum. There are two fountains like this outside of the museum in the locations of the two original towers. It was recommended that we purchase tickets ahead of time (you have to select a date and time for your visit). It’s quite a somber and sad museum to visit, but I think it’s something that everyone should do at some point. We all kind of split up and looked around at our own pace, and we did not rent headsets. There are so many exhibits to look at. 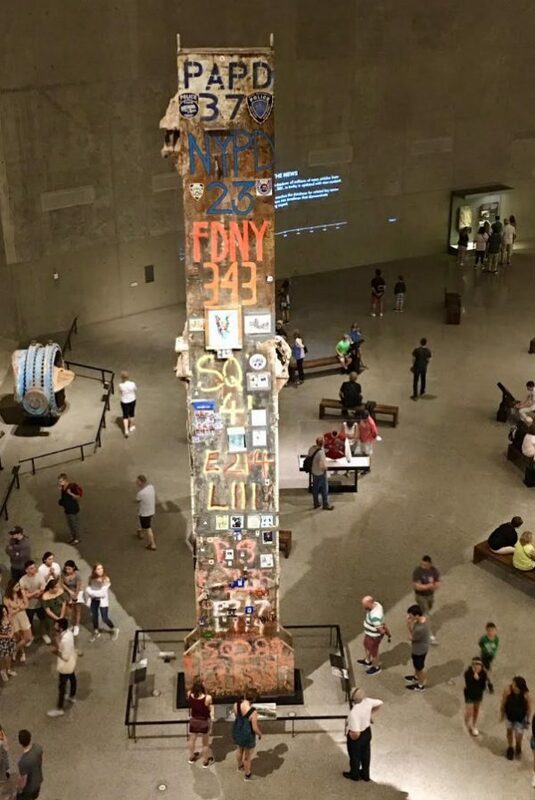 It’s all a part of history, and I feel like it’s a nice tribute to all of those who lost their lives on that horrible day. A few tears were shed. Our boys said they were glad they went. 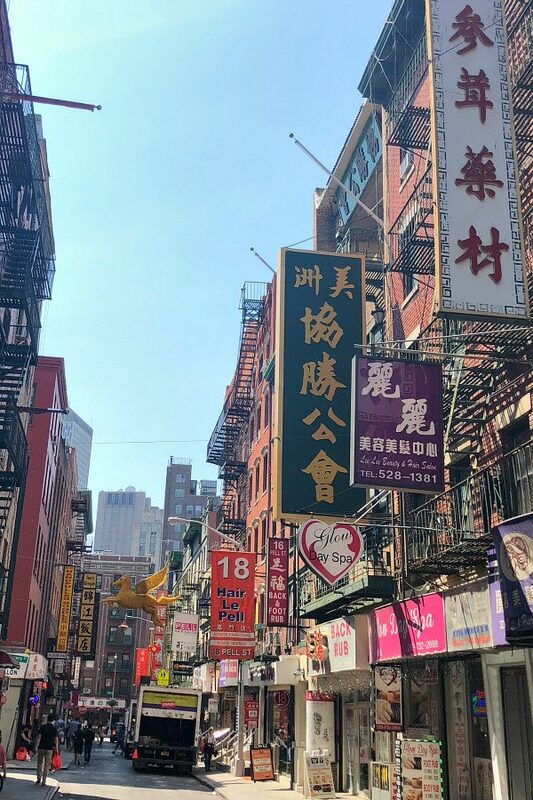 Visiting Chinatown is another NYC recommendation. It’s pretty crazy and crowded, but there is a lot to look at. If you’re looking for “designer goods,” there is no shortage of that sort of thing in Chinatown. You’ll be approached to see if you want to buy such goods, but I’m pretty sure it’s not a legal exchange so be careful! There are plenty of trinket kinds of shops to look around in here. But the best thing to do in Chinatown is eat! We found the absolute best restaurant in Chinatown. It’s tucked away in an alley, there are tons of locals who eat there, and the food is SO GOOD. Be sure to go to Joe’s Shanghai when in Chinatown. 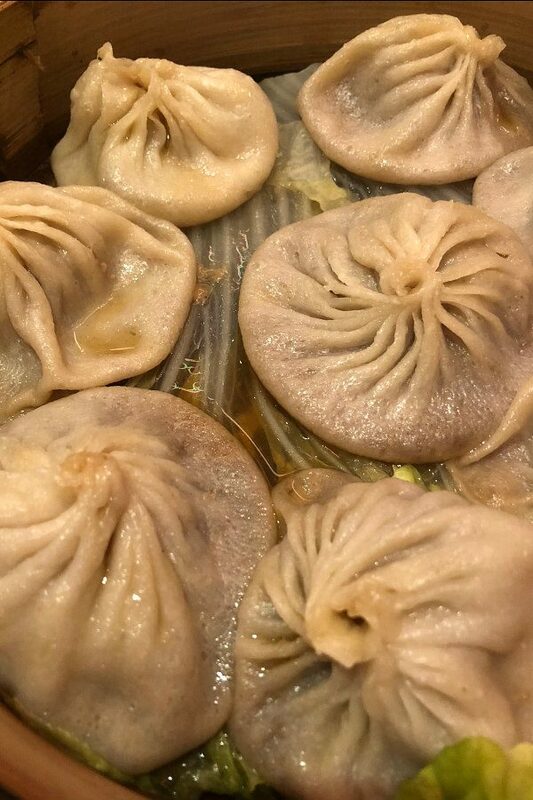 Pictured above are their Soup Dumplings, and they are a must-try. I have some more recommendations for Chinatown eats in my list at the end of this post. A good thing to do before or after visiting Chinatown is walking or biking the Brooklyn Bridge (you can get there via the subway). The bridge is 1.3 miles long, and it takes about 30 minutes to walk across- unless you are stopping to take pictures. There are food trucks on the other side. 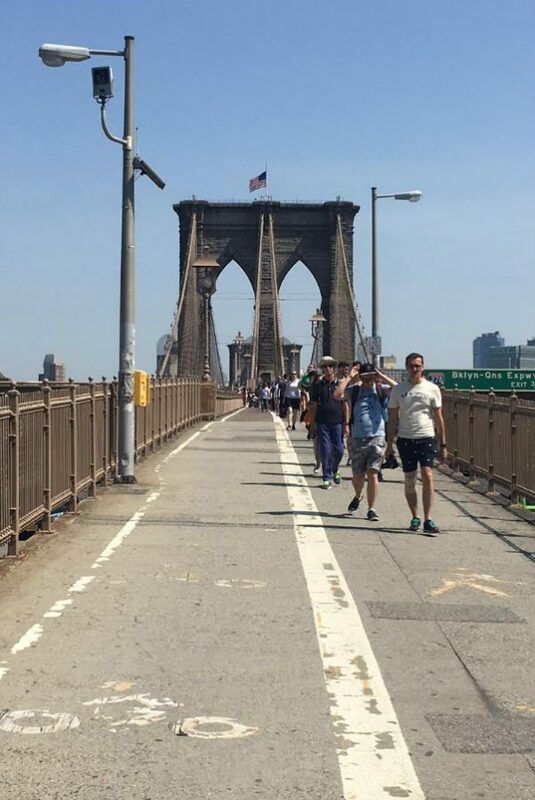 If you’re interested in walking across the Brooklyn Bridge, I’m going to link to a post with some great information and tips: Top 10 Tips for Walking Across the Brooklyn Bridge. My son is interested in designer clothes, so we headed over to SoHo to check out the SUPER HIGH END designer stores. We didn’t have enough money to buy anything (um $600+ sneakers), but we both enjoyed seeing it all. 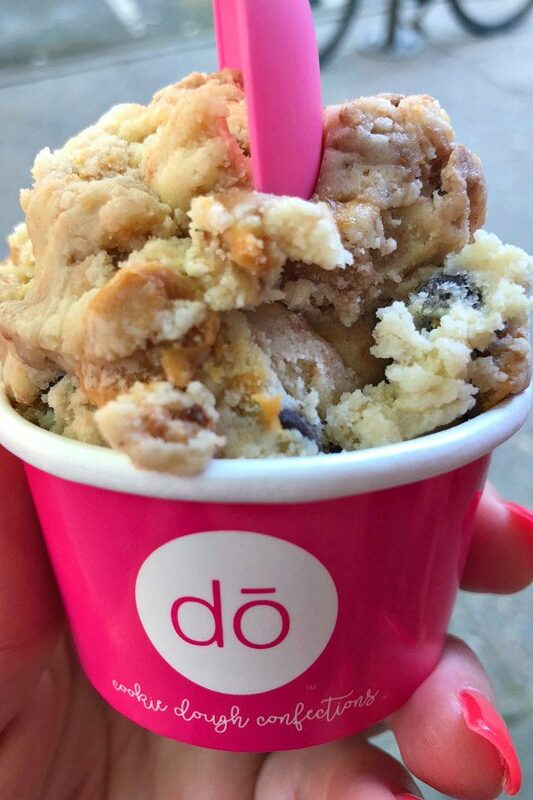 If you’re in this area, I recommend stopping at DO Cookie Dough Confections for a scoop of cookie dough (served just like ice cream). Just walking around the city is an activity in itself. There is so much to see. And if your boys are not used to a big city, the building are so enormous and it’s fun to look up! More shopping! If your boys are into fashion, you can take them to the largest Macy’s- it’s like 8 floors of clothes and shoes. If they’re not into shopping, then the Moms can take a break from their boys and go to Macy’s by themselves!! 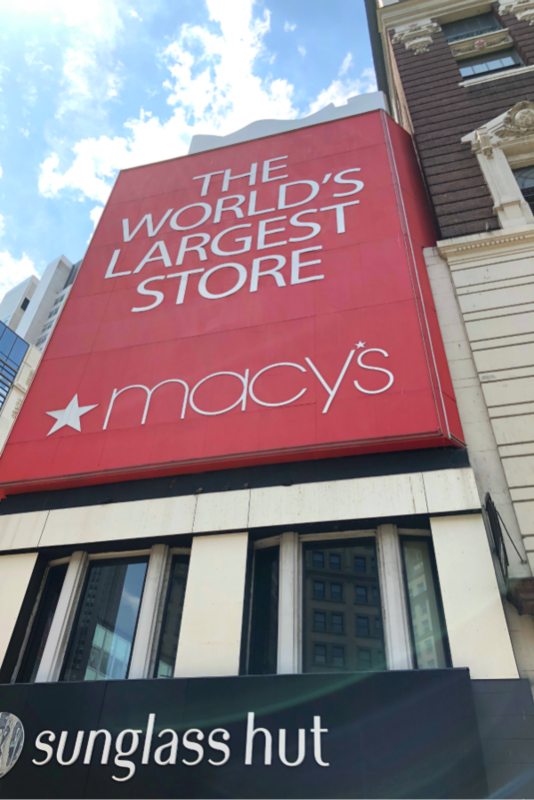 Macy’s Herald Square is located in Manhattan (walking distance from Times Square). 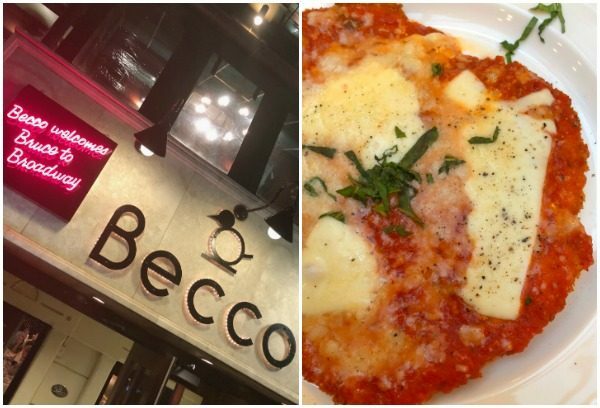 If you are headed to see a show, Becco is the best place to eat dinner prior to the show. Lidia Bastianich & her son, Joe, opened Becco in 1993. Just be sure to make your reservation far enough in advance to be able to relax and not be hurrying to eat so you can be on time for the show. Becco is in the Theater District. I’ve been here a handful of times over the years. They have really good Italian food, and teenage boys will likely enjoy the unlimited table-side pasta option. 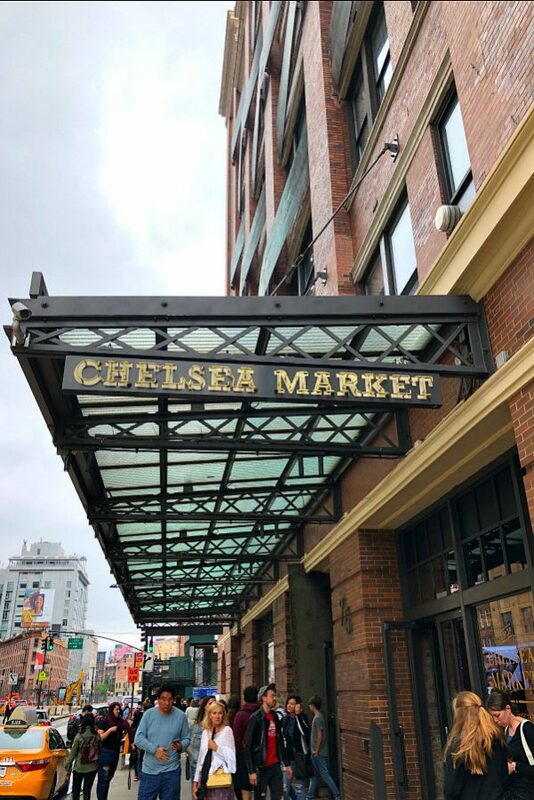 Another food option is to go hang out at Chelsea Market in the Meatpacking District. It’s an indoor marketplace (a block long)- some shops, but mostly focused on incredible bites to eat. I recommend Takumi Taco (Japanese- Mexican Fusion Tacos) and Doughnuttery (mini gourmet donuts!) There are a LOT of food places to choose from. 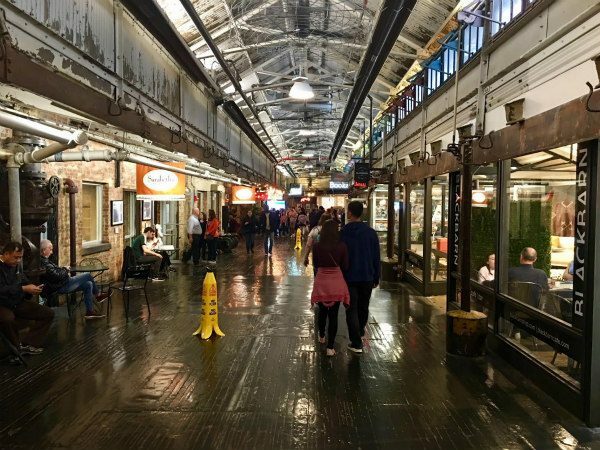 This is what Chelsea Market looks like inside. It can get very busy during lunch and dinner times! 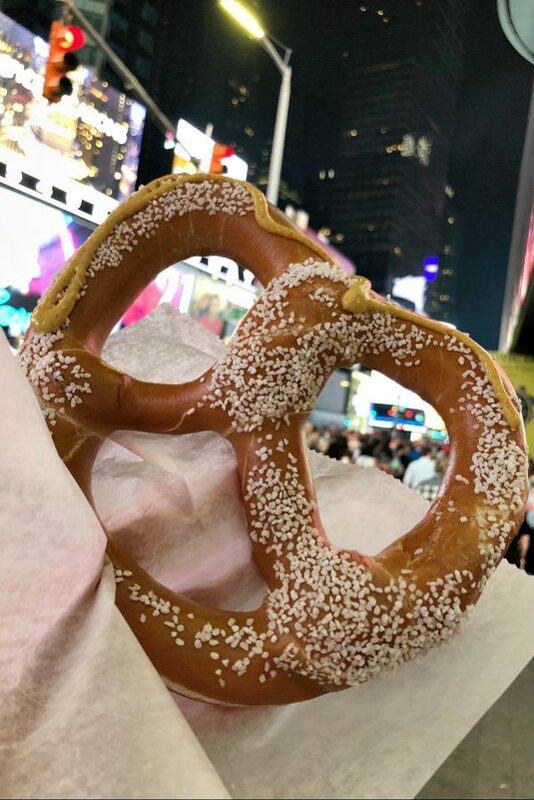 Be sure to grab a warm pretzel at some point from a vendor in Times Square! Going to a stand-up comedy show was something that the boys kept hinting at while we were there. 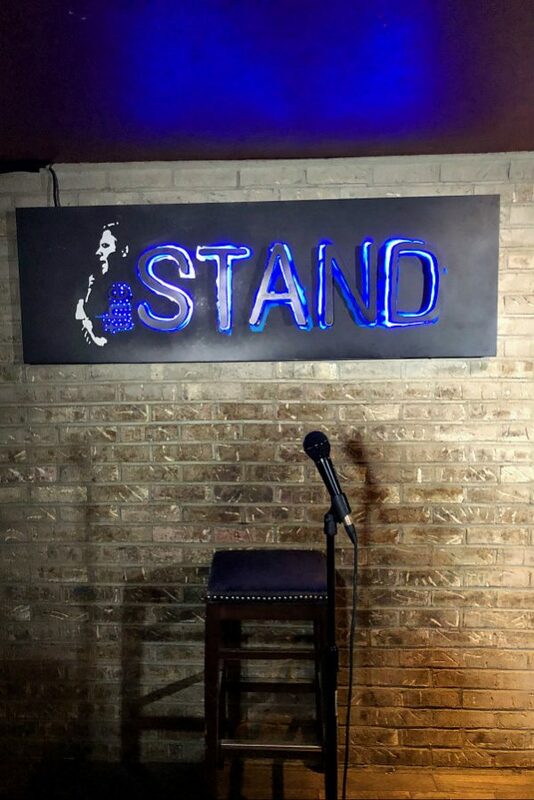 I did some research and found this place- The Stand (Gramercy area). You only have to be 16 to get in. I knew it would probably be quite a risque show with adult themes and adult language. But our boys are 17, they’re good kids, and we were sure they’d enjoy it and all would be fine. The venue is in the basement of a bar with a little stage and about 75 chairs max surrounding the stage. It is a small and intimate setting. There are no bad seats. This particular night, there were 4 or 5 comedians performing. It was nice to experience a variety. We all loved the show, and we laughed until we cried. I totally recommend adults seeing this. Use discretion on whether or not your teenage boys should see it! Apparently the current location of The Stand is closed right now (with a few summer pop up shows), but it looks like they’re opening a brand new venue in Fall 2018. I hope the new setting is as awesome as the old one! 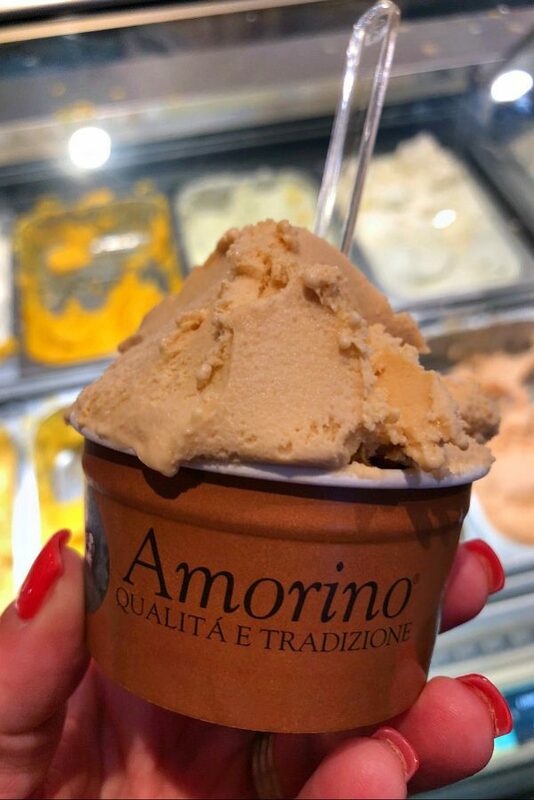 Back in the Theater District, you must experience the best gelato in town: Amorino. My favorite flavor: Salted Caramel, of course! 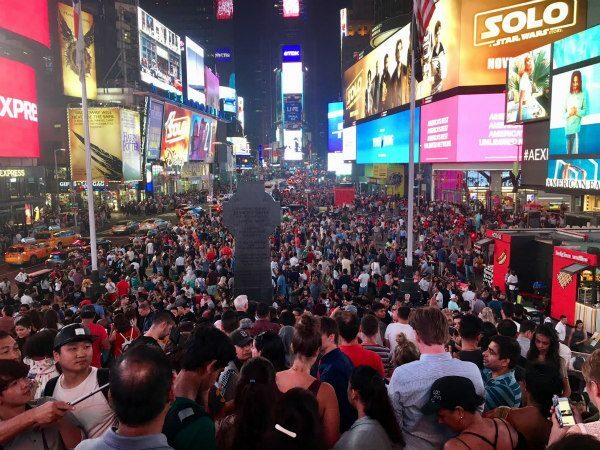 This is Times Square at night in the summertime. It was packed with people (tourists) but so fun! And that’s a wrap! 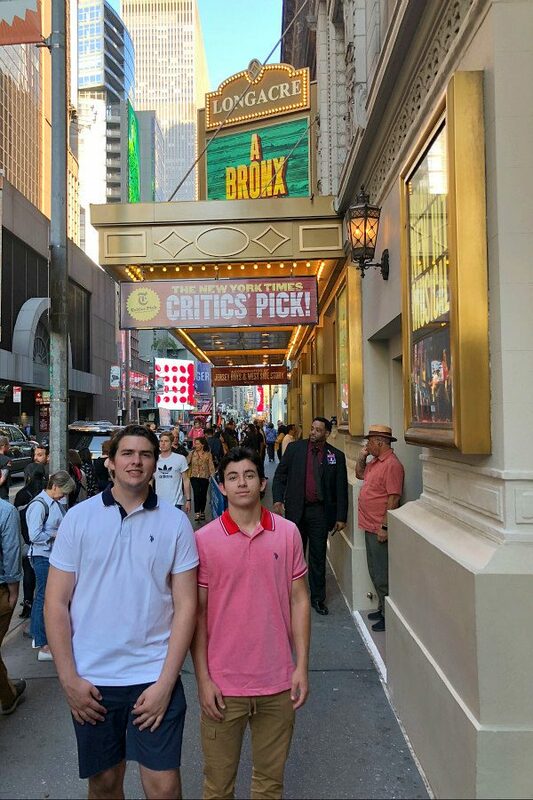 We had such a great time in New York City with teenage boys (our own), and we created some nice memories together! Paramount Hotel (near Times Square) see my description of this hotel at the beginning of this post. Get tickets to be in a live audience more info here: tips for getting tickets to a show taping (note that some show require you to be over the age of 18, but Jimmy Fallon and Seth Myers are both 16 and up). Note that you have to try and do this many months before your trip. You can get tickets for some of the morning shows too- like LIVE with Kelly and Ryan. Coney Island. Ride the Cyclone and the Wonder Wheel. Dip toes in the Atlantic and have dinner at Nathans Famous. Pizza: try Di Fara Pizza (Brooklyn), Patsy’s (East Harlem), Totonno’s (Coney Island), Otto (Greenwich Village) Emily (Brooklyn or West Village) or Lombardi’s Pizza (Little Italy). Italian: Becco (Theater District), Carmine’s (Times Square) or Tony di Napoli (Times Square or Upper East Side). Mario Batali’s Eataly (Flatiron District) is also pretty cool, but can get pretty busy so plan for that! Chinatown: Joe’s Shanghai, or Golden Unicorn. Afterward, head to the Chinatown Ice Cream Factory or 10 Below for rolled ice cream. Dessert: Serendipity for their frozen hot chocolate, Dominique Ansel (pastries), Levain Bakery– the best chocolate chip cookies, Max Brenner Chocolate Bar (Union Square), cheesecake at Junior’s (several locations), gelato at Amorino (Theater District), Magnolia Bakery for red velvet cheesecake and banana pudding (several locations), The Sugar Factory (several locations). I love this post and it is so timely! My son is going to Fordham University in the fall and since he will be there for 4 years (hopefully!) this post is perfect. Great recommendations for everything including all that yummy food. We love Carmine’s when we go–relaxed, delicious, fun! Thank you so much. I also used your San Fran post extensively and it came in handy. We also stayed at the Argonaut on your recommendation and loved it. Of course, love love your recipes, but the travel posts are really great, too. Thank you for all of this you do!!! Happy to hear! Thank you! I loved this cause we like to go to NYC about every 2-3 years and we are going to follow your recommendations. We always eat at Becco. Do you have any posts on what to do in San Francisco. We’re going there for our anniversary in August and would like new ideas since we’ve been there also. Hi Lori! I loved reading your post. I have four boys so I couldn’t resist the title. Great info. and suggestions, will def. come back to check out all your recommendations next time we head in to the Big Apple!